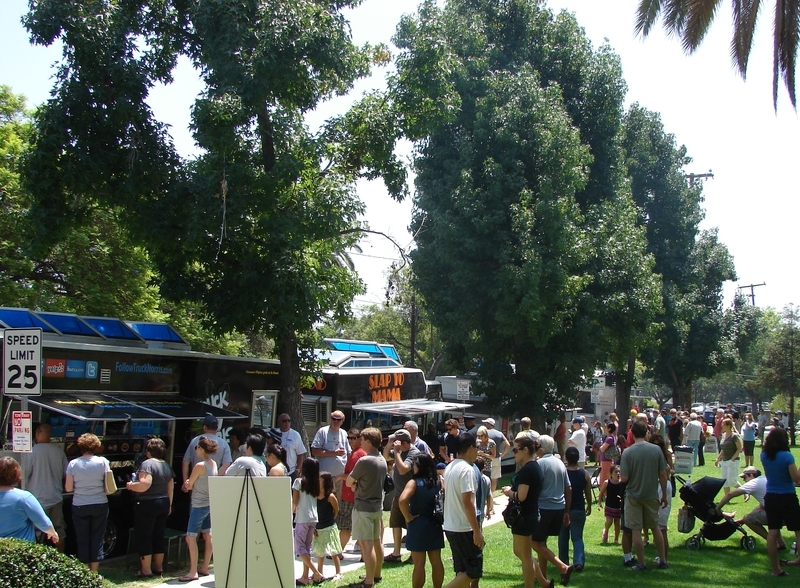 The Sierra Madre Chamber of Commerce will host a second Gourmet Food Truck Festival in Memorial Park this Saturday, August 27th, scheduled from 11am to 6pm. The first festival, held August 13th, drew hundreds, both locals and non-locals, to Memorial Park to dine at eight of the popular traveling kitchens. All of the trucks ran out of several menu items, with Nom Nom, which features Vietnamese Banh Mi and is best known for its second place finish in the Food Network’s “The Great Food Truck Race” selling out entirely and hitting the road by 4pm. In addition to the food trucks, some local businesses set up booths to promote their businesses, offering merchandise and massage, and the Sierra Madre Rose Float Association, which will receive 20% of the commission paid to the Chamber by the Food Trucks, also had a booth, as they will again this weekend. Wondering what next year’s float will look like? Stop by the SMRFA booth and see the colorful rendering of Sierra Madre’s 2012 entry in the Tournament of Roses Parade. This week’s Festival will feature ten trucks: the Go Country 105 Chuckwagon, Crepe’n Around, Peanut Butter Bar (gourmet peanut butter sandwiches), Sloppy Gourmet (gourmet sloppy joes), Get Your Lard On (think bacon), Grilled Cheese Patrol, Dumpling Station, Krazy BBQ (Korean BBQ), Lake Street Creamery (ice cream, gelato and sorbet), and Los Angeles Shave Ice. All trucks are subject to change without notice. The Chamber of Commerce wishes to thank its Silver Level Annual Sponsor Athens Services, which assisted with the marketing of the event, as well as S and S Rent a Fence and the City of Sierra Madre for their assistance in staging the Festivals. In addition, Athens Services, Rotary Club of Sierra Madre, and Kiwanis Club of Sierra Madre sponsored dining tables at the event.